Turpentine is a plant-based oil painting medium used in the production of oil works to adjust the viscosity and concentration of the paint and to dilute dry oil. Painting mediums used in oil colors comprise mainly two types: volatile and dry oil. 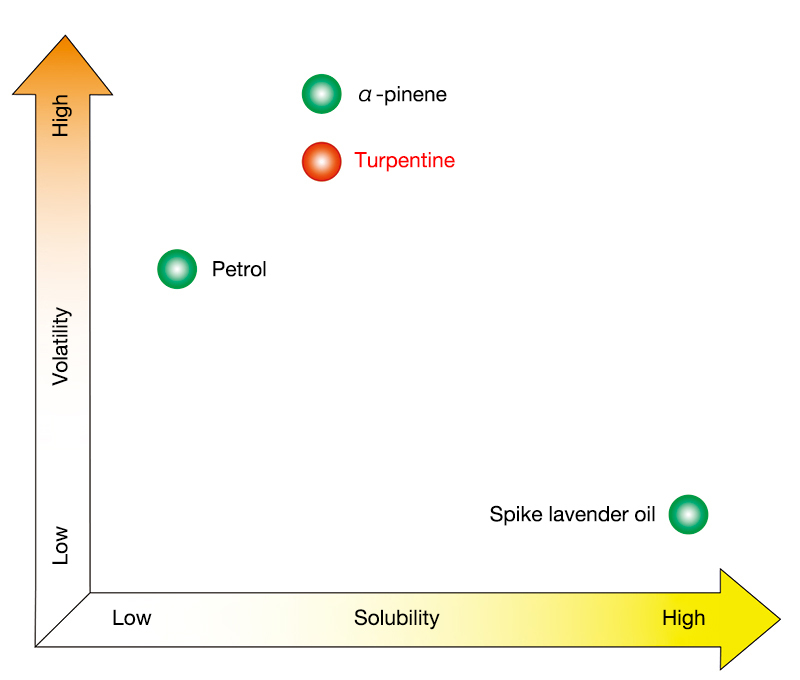 Turpentine is classified as volatile oil and most of the contents evaporate into the atmosphere after use. Its properties can also be used for dissolving gum. It is a plant-based volatile oil made by distilling and refining pine resin to produce α-pinene, β-pinene, camphene and dipentene, which are its main components. It evaporates faster than petrol (a mineral-based volatile oil) and has greater dissolving power. Turpentine is used mainly in the early stages of the oil painting product process such as when doing preliminary sketches and starting to paint. To use, add a solution of dry oil diluted with turpentine to a font or some other container, dip the tip of a brush into the solution when required, adjust to the required viscosity and concentration by combining this with the oil paint on the brush tip and then begin painting. The solution will have more turpentine and less dry oil when the painting begins but the ratio of turpentine will gradually reduce as the work continues. Other uses also include use as an agent to dissolve gum (Dammar gum, etc.) when making your own blended oil or varnish. Note that turpentine contains no ingredients that will fix the paint to the support and so overuse can degrade the durability and fixing capacity of the painting or detract from the gloss of a color work piece. Because of its volatility and flammability, interior environments should be well ventilated and the turpentine should be kept well away from naked flames. When stored, oxidization can produce a gummy, sticky solution and yellowness. Make sure the lid is closed firmly and keep away from hot environments. 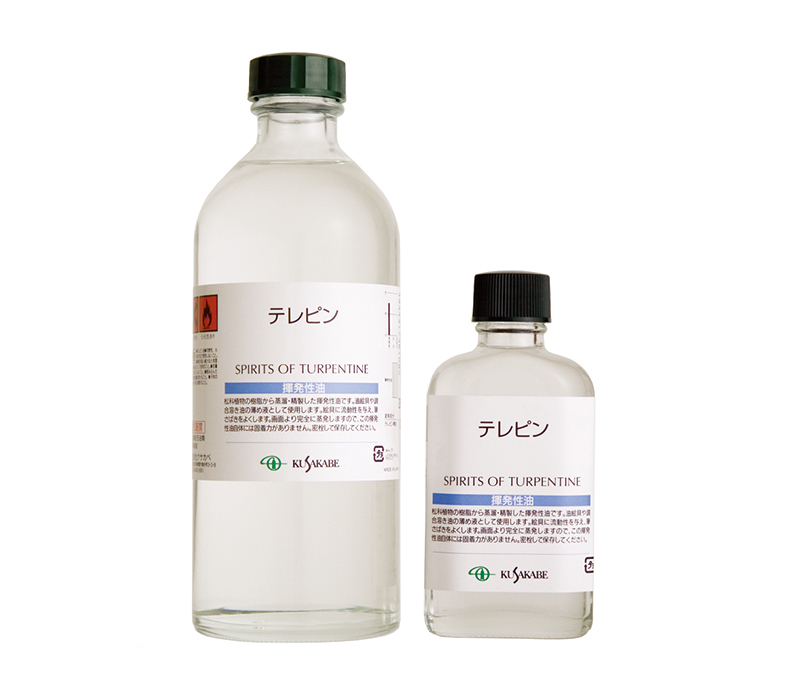 Turpentine can be purchased at general art supply stores.